If I look after the sparrows, I will certainly look after you. 6 “Aren’t five sparrows sold for two assaria coins? Not one of them is forgotten by God. 7 But the very hairs of your head are all numbered. Therefore don’t be afraid. You are of more value than many sparrows. 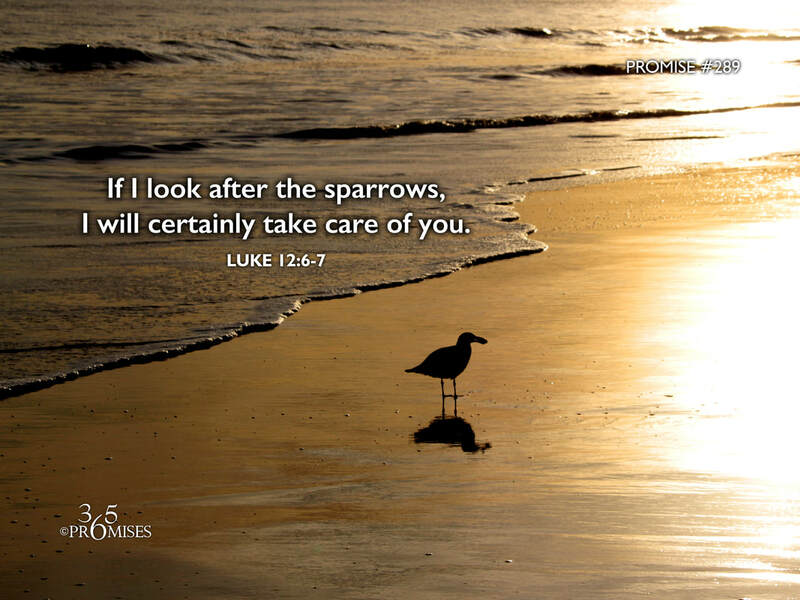 I love this passage of Scripture where Jesus tells us how important the sparrows are to God. Even though they do not have much value to us, He will not even forget one of them. In Matthew 10:29 Jesus tells us that not even one of them will fall to the ground apart from His Father's will. This is the value He places on a single bird! But then Jesus goes on to tell us that we have a value to God worth more than many sparrows! So if God looks after and watches over these little birds, how much more will He watch over us? Our value to God far exceeds the birds of the air who neither sow or reap or store into barns (Matthew 6:25-34). The next time you are feeling anxious about the future, just take a moment and look at a bird, or a squirrel, or a tree for that matter. God provides for all that He created because that is simply what good fathers do. If He looks after even the most insignificant of His creation, will He not also look after you?